Sleeping and Learning: Does the first help the second? Posted September 14th, 2016 by Mike Boyes & filed under Consciousness, Health Psychology, Memory. Description: Okay, if certainly heard some version of they get a good night’s sleep before a test advice many many times already. So do you think there’s any truth to that statement? What might the relationship between sleep learning and memory be? What you thought a bit about what the possibilities could be read the article linked below and then reflect a little bit on your own study/sleep habits think about whether you might need to change anything. Source: Sleep Makes Relearning Faster and Longer – Lasting, Association for Psychological Science. What research is starting to show is that it’s not just a good idea to be rested prior to writing exams but in fact there may well be important relationship between sleep and the pacing of learning sessions. In the study linked above the researcher systematically varied when students worked on lists of items they were asked to remember, when they had their recall tested, and when they slept. The researchers also buried the pattern of relearning efforts, that is whether students worked at relearning a list that they’d already studied once before or after having had a night’s sleep. In addition, the researchers also controlled for short-term memory capacity and other variables related to memory competence. The bottom line was that the clearly seen to be something about the participant’s sleep that led to them doing better on a variety of assessments of their memory ability. The study is one of a number of studies indicating that sleep may play an important role in how human beings process information and consolidate learning. What seems to be the relationship between sleep and memory? How is the relationship between sleep and memory different for simple memory and for memory relearning tasks? 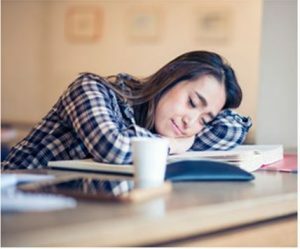 Given what this research suggests about the potential relationship between learning and memory and sleep can you think of any ways in which you might adjust your own study and sleeping habits to take advantage of some of these findings are suggesting? Mazza, S., Gerbier, E., Gustin, M. P., Kasikci, Z., Koenig, O., Toppino, T. C., & Magnin, M. (2016). Relearn Faster and Retain Longer Along With Practice, Sleep Makes Perfect. Psychological Science, 0956797616659930.